Preferred Networks Inc., a Japanese venture specializing in artificial intelligence, unveiled on Tuesday a fully autonomous tidying-up robot for home use. The Tokyo-based startup created software for the cylindrical robot, around 100 to 135 centimeters tall and weighing some 37 kilograms, which was developed by Toyota Motor Corp. for assisting the elderly and disabled. 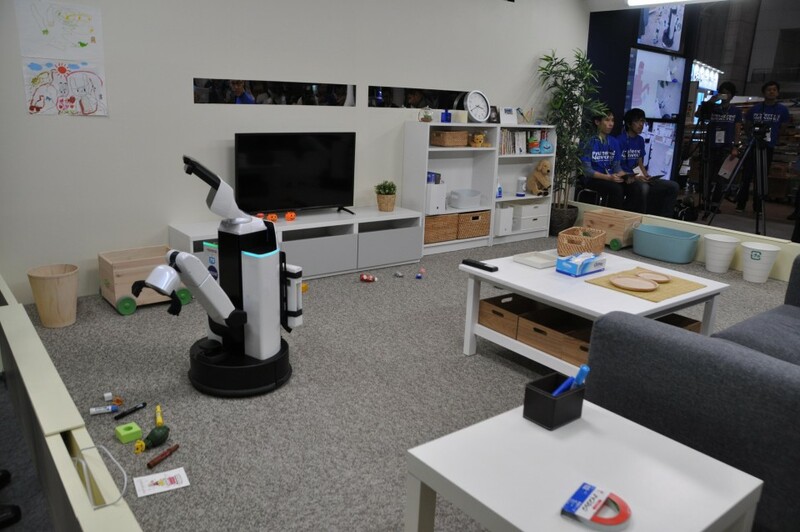 The support robot features a camera on the top of it that enables it to recognize objects scattered in a room such as socks, toys and stationery. Moving at a maximum speed of 800 meters per hour, it uses a folding arm to pick up and place such materials in designated locations. With the "deep learning" method, AI on the robot learns from data stored when it operates, such as the shape of a room and location of furniture. "We envision a society in the future where robots are used in every aspects of life," said Preferred Networks President Toru Nishikawa in his speech on the opening day of the Combined Exhibition of Advanced Technologies, or CEATEC, where the robot is displayed at its booth. "I hope to further propose new robot systems that can flexibly respond to changes in environment," Nishikawa said at Makuhari Messe convention center in Chiba Prefecture near Tokyo. The exhibition runs through Friday. Preferred Networks, founded in 2014 and which has mainly developed software for industrial robots, is one of the few Japanese "unicorns," or an unlisted technology startup valued at more than $1 billion, and has been invested in by major Japanese companies including Toyota and industrial robot maker Fanuc Corp.
At its display booth, the venture demonstrated two of the robots. They moved around a messy living room, picking up objects like socks and slippers and putting them into boxes. They also changed paths when a demonstrator gave them voice instructions.